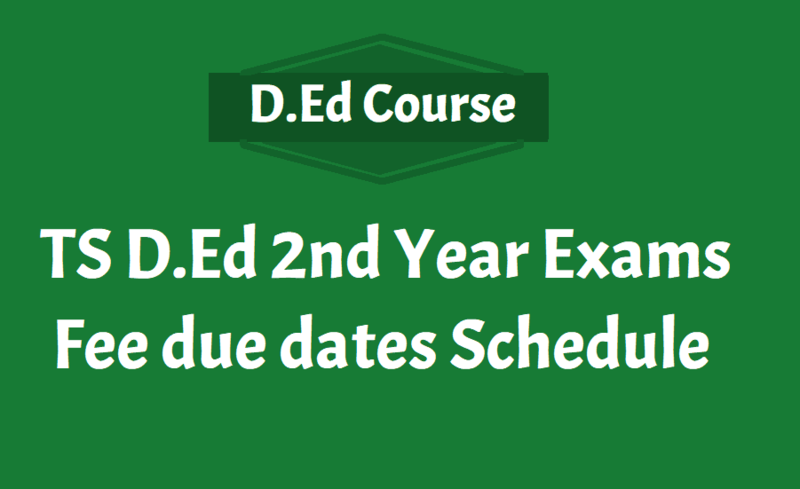 TS Ded 2nd year exam fee date 2019 released for 2017-19 batch : Director of Government Examinations @ DGE Telangana has published the Deled second year exam fee schedule for remittance for Diploma in Elementary Education (D.El.Ed) 2nd year examinations of the 2017-19 batch. The TS D.El.Ed 2nd year examinations for the 2017-19 batch will be conducted in April 2019. The failed candidates in earlier batches (from 2015-2017 only) who have studied revised syllabus are also eligible to appear in this examination as once failed candidates. Remittance of TS Ded exam fees without late fee is 24th January. The last date submits with fine Rs.50/ is 28th Jan 2019. The principals of the institute must submit the examination fee in the Government treasury by January 25, 2019 and for candidates who submit examination fee late by January 29, 2019. The practical fee for regular and failed candidates through consolidated challans in the treasury of Government to the following Head of Account.